My fault, really. I had planted a “California Pepper” tree on the north slope, right by the boundary wall with our neighbor’s yard. 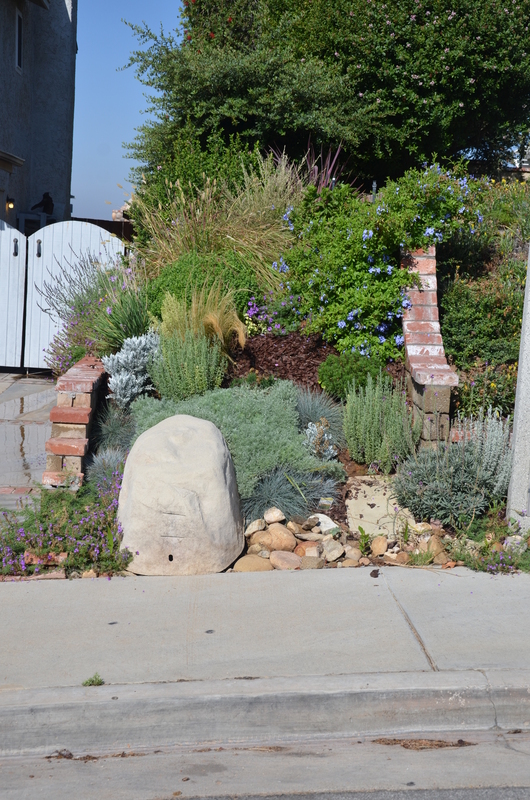 This Peruvian native grows well in Southern California, but it has surface roots that broke the block wall. So we had to take out the tree and replace the wall. The slope had a cotoneaster as well, which had overgrown the space. It was all a green mess. We needed to start over. Back to bare dirt in the front, and then I hacked and hacked on the cotoneaster and another unidentified bush that we left in front of it. The slope is about 6′ wide and 35′ long. We’re doing the landscape from the front sidewalk to back beyond the front gates. We took the slope all the way to bare dirt. 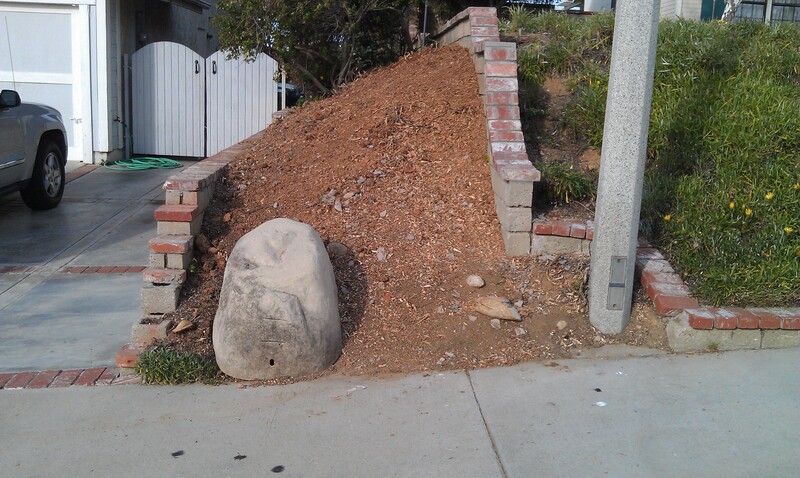 Well, dirt, a “rock” covering the cable service for the neighborhood, and a light pole. There’s a cable service panel that is currently covered with dirt; it needs to be uncovered as well. I thought the most important thing was to make sure we were putting the right plants in the right places … so we didn’t have to do this whole process again in 5 years. Like we were now doing after failing with the last planting. And the one before that. My favorite nursery, come to find out, had taken to not labeling the plants that it sold, so I found myself adrift in a sea of green, without a clue about what was what. This really bothered me … what kind of retailer doesn’t tell you about their products? We shopped four nurseries (see what happens when you frustrate a customer? ), taking note to read what the tags said on each plant. Basic stuff, right? Home Depot’s nursery shows QR codes on their plant tags. We took pictures of plants and tags. That all came home, and then the online searches began. Each plant was researched to make sure we knew where to plant it. We’re climate zone 10, come to find out, and so we had to buy the right plants for this area. That should be obvious, right? Not so much; nurseries always push the envelopes for the “pretty plants” that people want to try. I wanted to make sure we were planting sure bets. 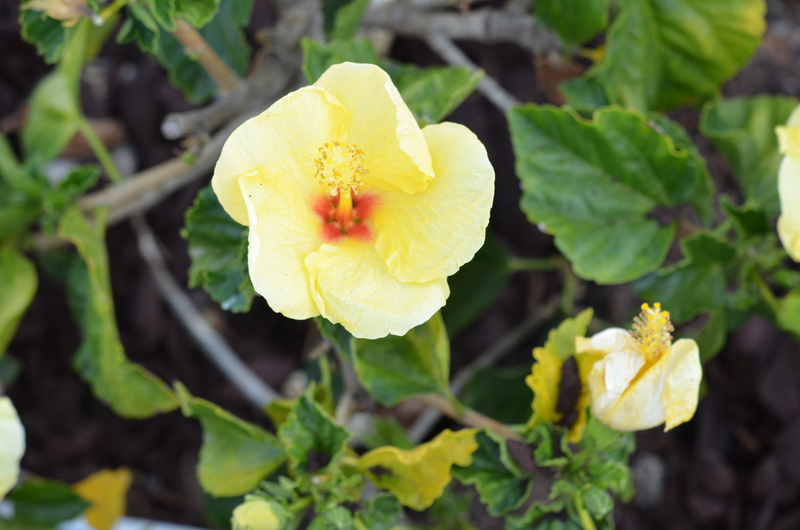 A Hula Girl Hibiscus went into a prominent position. Had to show our love of Hawaii somewhere, yes? We did a planting plan, showing the position of each plant. Holes were dug, with each pot resting in that plant’s hole. All good? Ready to go. While planting, we added Velda’s compost with the bagged dirt we were adding so that each plant had really great soil to grow in. We then added mulch on top of the soil … bags and bags of it. Crank up the sprinkler system (this is California, remember), and we were ready for spring and summer. Same view, 5 months later. What fun to see the area I have seen up close and personal! THANKS for the glimpse of your home area!